First private university in Malaysia to become the overall champions for three consecutive years having collected the most medals in the 12 years of the sports carnival’s history. 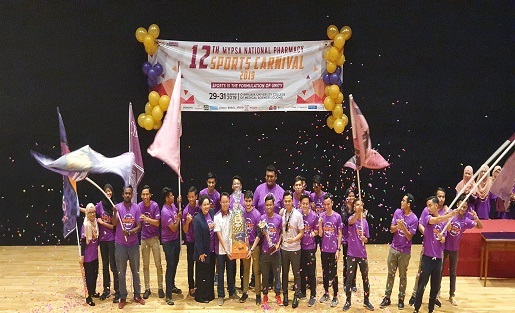 Cyberjaya, 1st April 2019 – Cyberjaya University College of Medical Sciences (CUCMS), a 5-Star university, bagged 15 gold medals at the 12th MyPSA National Pharmacy Sports Carnival (NPSC). The sports carnival is organized yearly by the Malaysian Pharmacy Students’ Association (MyPSA) with an aim to create a platform for pharmacy students to cultivate a balanced and healthy lifestyle. The carnival saw a gathering of pharmacy students from 18 universities. 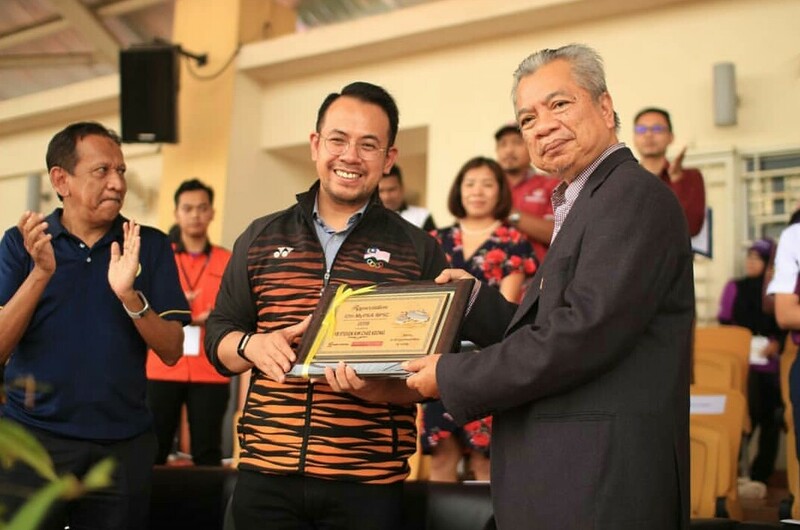 The event was hosted by CUCMS from 29th to 31st March 2019 and was officiated by Yang Berbahagia Mr. Steven Sim, Deputy Minister of Sports and Yang Berbahagia Datin Mariani Ahmad Nizaruddin, Vice President of Malaysian Pharmaceutical Society and advisor to Malaysian Pharmacy Students’ Association. The event was highly competitive as all students came ready to compete for the coveted title as champions. CUCMS’s team edged the likes of USM (1st runner up) who bagged 10 gold, 5 silver and 6 bronze, AIMST (2nd runner up, 6 gold, 8 silver and 6 bronze), UiTM, Taylors, IIUM, UKM, Monash, UCSI and the rest in coming up tops for the third year in a row. CUCMS’s Pharmacy students won the competition with 15 gold, 16 silver and 7 bronze medals and were named the overall champion for this year’s event. The contingent was led by Mobeen Dar Bin Allah Rakha Dar and Assistant Prof. Madam Shairyzah Ahmad Hisham as the advisor. A group photo of CUCMS’s Rx Pharmacy Students after being announced as the overall champion at the MyPSA 12th National Pharmacy Sports Carnival (NPSC) 2019. “We always encourage them to take part and excel in both academics and extra-curricular. I would like to congratulate all the lecturers and students for their dedication and their efforts to go the extra mile for the team” she added. The 15 gold medals were won from different events such as athletics 100m (men), 4x100m (men), 400m (women) and shot put (men); tennis (men) single. Swimming is CUCMS’s biggest contributor of gold medals with 7 gold from the various categories such as; 4x50m medley relay (men and women), 4x50m breaststroke relay (men), 4x50m freestyle relay (men), 50m butterfly (men), 50m backstroke (men) and 50m freestyle (men). Last year, the university was also named as the overall champion and it gave an intense pressure for the team to retain its’ title this year. Nevertheless, the hard work and commitment the athletes gave were all paid off when they were crowned champions for three years in a row thus making history as the first private university to do so. Assistant Prof. Madam Shairyzah Ahmad Hisham, Advisor for the Contingent said, “I made sure the students were equipped with a systematic training long before NPSC. The students have to go through weekly training during the semester and during the mid-semester break in January and March, the faculty initiated a 3-day intensive training course to ensure optimal performance and stamina is achieved. Besides that, I also encouraged the students to spend leisure time together after training to establish strong bonds between teammates”. “Our goal this year was not so much on to retain the championship but more on to ensure that we can be an exemplary host for the 12th NPSC 2019. The hat trick championship was a pleasant bonus!” she added. Mobeen Dar Bin Allah Rakha Dar, CUCMS Head of Contingent said, “We are grateful to be announced as the overall champion of the 12th MyPSA National Pharmacy Sports Carnival 2019. As the head of the contingent, I think it is very important to build up a good rapport with the rest of the athletes and gain their respect. I believe only by doing so can you ever hope that all the players will be committed to the cause. I also always monitor each teams’ progress and players conditions, making sure that they are mentally and physically prepared to face our opponents in the games.” He is also a third-year pharmacy student and a silver medalist for futsal (men). Back in 2017, CUCMS became the first private institution to have become the champion of this tournament and collected the most medals in NPSC 11 years history. Throughout the decade, past champion includes International Islamic University Malaysia (IIUM) for seven consecutive years (2008 – 2014) and Universiti Sains Malaysia (USM) for two consecutive years (2015 – 2016). “As a student-athlete, we are expected to spend a significant amount of time on the field – training, practicing and participating in tournaments, however, I firmly believe with the right balance, sports and studies can be a winning combination. In being named ‘Sportsman of the Year’, he said he is truly grateful to all his teammates and coaches that believed and supported him since day one. 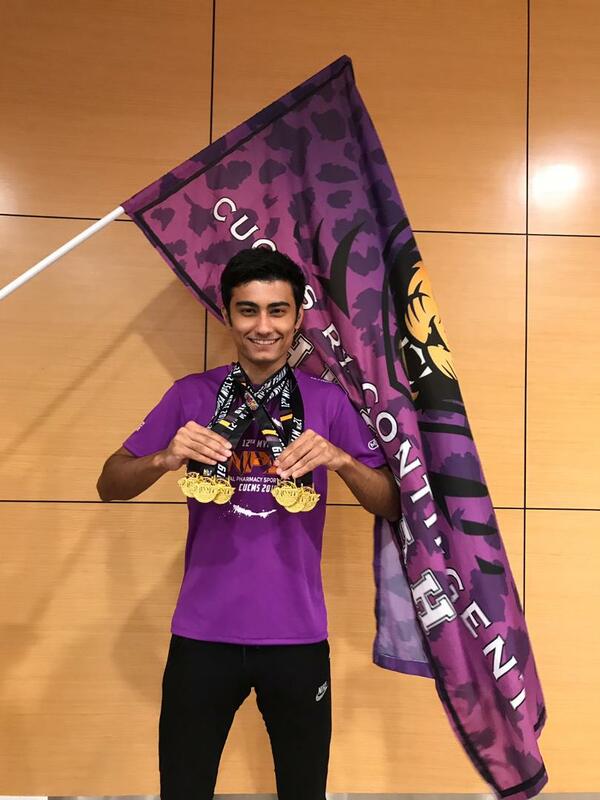 “I did not want to disappoint them so, I tried my best to win it for the team”, said Arslan Charyyev, a first-year pharmacy student and the Gold medalist for the men’s athletics 1500m (men) and 4x100m relay (men). He is also the contributor of four gold medals for swimming events; 50m butterfly (men), 4x50m freestyle relay (men), 4x50m breaststroke relay (men) and 4x50m medley relay (men). Felly Alvina, a final-year pharmacy student and a Gold medalist for athletics women 200m and 400m and Silver medalist for said, “To ensure a perfect balance between studies and sports, is difficult but it’s not impossible. We should prioritize our time and have excellent time management. It is always important to remember that sports are meant to be an addendum to education, and academics should always take priority. Besides that, the support and love from my lecturers and family fueled up my skill to maintain a good balance between academics and sports.